As summer gently recedes to autumn, the weather cools down to a more bearable temperature of beautifully warm-hot days and crisp nights. And as it does so, you can still enjoy the pristine coasts, but can also add a multitude of other great things to see and do to your Larnaka list! This season, the programme of complimentary winter activities is back, ready to fill your days with different experiences, and the new Piale Pasha sea road is ready to welcome you on foot or by bike. Bird lovers will be thrilled to discover the new bird watch at Voroklini Lake, which is home to many rare bird species, whilst culture vultures can learn all about one of the island’s most cherished traditions – that of handmade lace in the mountainous village of Lefkara. And with the help of a new thematic map, you will have no problem finding your way around all these wonderful activities and sights… and a whole lot more in the region. So, with the sun still shining and the scope of activities expanding, autumn in Larnaka really does offer the best of all worlds! Following the success of last year’s programme of complimentary activities for Larnaka hotel guests, winter 2014/2015 will also offer the wonderful array of experiences. The programme runs from November 1, 2014 - April 30, 2015 and offers a jam-packed timetable with something different every day of the week including excursions to villages, city tours, halloumi making, beach gymnastics, musical shows and free entrance at the Camel Park! The LTB and Larnaka Municipality have launched an exciting new incentive scheme aimed at airlines that add new routes to Larnaka International Airport, or increase the frequency of their existing ones. As a thank you for their commitment to Larnaka, airlines that fit the criteria will be offered one month’s complimentary poster advertising for the new routes in five key points in the city centre. As Larnaka’s popularity continues to rise, the region is responding to the influx of visitors with a host of new hotels scheduled to open in 2015. The five hotels consist of a mixture of brand new establishments and reinstated and adapted buildings, spread out across the town to offer a better variety of accommodation. The new hotels are located in the city centre and Mckenzie Area, whereas Dekeleia Road will see the reinstatement of previously closed hotels. Foinikoudes to be Given Facelift! Following the renovation of Piale Pasha, focus will now be on Larnaka’s most famous and loved promenade, the palm-tree lined Foinikoudes, with a series of cosmetic changes planned this fall. According to the Larnaka Mayor, the facelift will include the repair of any damaged areas of the paved surfaces, a renovation and upgrading of the seafront stage, the sowing of grass along the road towards the beach, and generally adding more greenery to the area. The new Piale Pasha road is currently the favourite spot for a stroll, run and cycle thanks to its fantastic new paths. The redevelopment of the area means that you can now walk the entire length of Foinikoudes to McKenzie with uninterrupted sea views, passing some interesting spots along the way. Aside from the beautiful views of the sea, you will pass by traditional tavernas, pottery workshops, the fishing harbour and the ice-cream parlours! New Thematic Map - Your Ideal Companion! A new thematic map of the Larnaka region has been published by the LTB in cooperation with Choose your Cyprus. The map promises to be the ideal travel companion with its concise and comprehensive overview of Larnaka, divided into three handy sections. 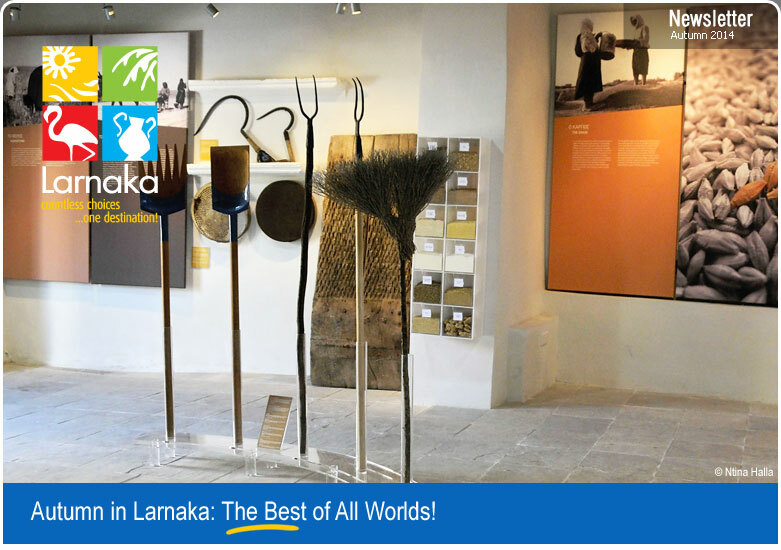 The first section is a map of the entire Larnaka region, the second is a map that zones in specifically on the bustling city centre and the third is a map dedicated to rural attractions and agrotourism. If you will be visiting Larnaka for the first time - or even if you visit regularly - no doubt you will be interested to have all the essential information for different leisure and sports activities collated in one place. To ensure that visitors get the best out of their Larnaka experience, the Larnaka Tourism Board has issued a list of the most popular activities to make planning a holiday to individual budgets and personal interests easy. The famous mountainous village of Lefkara has opened a new Handicrafts Centre where it will teach the traditional crafts of handmade lace and filigree silver, to ensure its arts are kept alive for generations to come. Mayor of Lefkara Mr. Savvas Xenofontos says the new centre was a long-envisaged project for the village: "In addition to teaching the crafts, the Centre will also serve to maintain, preserve and promote the two unique traditions". Voroklini Lake is one of only seven natural wetlands in Cyprus and very important on both a Cyprus and pan-European level. It is home to an amazing array of rare birds, all of which can be spotted at the new bird watch, complete with telescope and binoculars. Aside from the bird watch, there is also an information kiosk where you can find out all about birds such as the Cattle Egret, Spur-winged Lapwing, Spoonbill and many others which nest there.